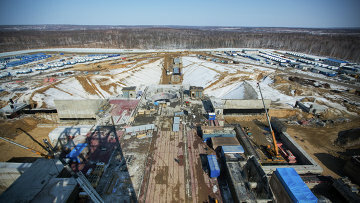 Second sentence of Vostochny Cosmodrome embezzlement case convict vacated | Russian Legal Information Agency (RAPSI). MOSCOW, October 15 (RAPSI) – The Moscow City Court on Monday overturned a second sentence given to engineer Sergey Ostrovsky, who had been convicted on two separate occasions of multimillion embezzlement during the Vostochny Cosmodrome construction in Russia's Far East, his attorney Vasily Khramov told RAPSI. The case has been remitted for fresh consideration, the lawyer added. Moscow’s Gagarinsky District Court sentenced ex-Chief Engineer of the State Design Institute for Special Construction Ostrovsky, who earlier received a 5-year term for embezzlement during the Vostochny Cosmodrome construction, to another 7 years in prison and fined him 1 million rubles ($15,300 at the current exchange rate). According to investigators, one of the Cosmodrome’s buildings was not constructed and put in commission in time due to his fault. Vacating of the judgment may result in Ostrovsky’s release from detention as the defense lawyers are going to motion for recalculation of a term he spent in jail after the first sentence was delivered, Khramov said. Up to date, the engineer is being held in detention for nigh on 4 years, the attorney added. In June 2016, the Gagarinsky District Court of Moscow sentenced Ostrovsky to 5 years in prison and fined him 800,000 rubles (over $12,000) for embezzling over 14.5 million rubles ($221,500) allocated for the construction of the Cosmodrome. Moreover, the court upheld seizure of interests in the apartments, several land plots in the Kaluga region, Land Cruiser owned by the engineer, over 36 million rubles ($550,000) and foreign currency accounts. Prosecution asked the court to give him a 7-year prison sentence and fine him 1 million rubles. Ostrovsky pleaded not guilty and motioned for acquittal.